They say never work with children or animals – but Richard Coward is happy to do both. The director of Ocean Life Education has spent the past 13 years combining two of his passions – protecting marine life and inspiring young minds. 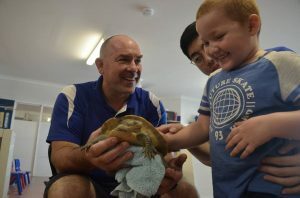 But the time spent in classrooms, early learning centres and at community events makes up only a fraction of the working day for Richard and his team of educators. The day usually starts before first light, checking on the crew of animal ambassadors to make sure they are healthy and raring to go on an adventure. The creatures are chosen on a rotational basis to ensure they receive rest days between their public appearances, minimising fatigue. Bags of oxygenated water are filled to provide a safe and comfortable space inside the travel tubs which will become their home for their time on the road. Apart from the cargo of animals, the van is loaded with extra salt water, games, artefacts, toys and books depending on the programs booked for the day. Details are checked and notes read through to make sure the educator is as prepared as possible for the day ahead. Then they join the line-up of commuters, criss-crossing South East Queensland as they slowly progress towards their first show of the day. Unpacking the animals and exhibits is an artform in itself, with tubs carefully stacked to limit the numbers of trips back and forwards. We allow half an hour to set up, giving the animals new water so they can breathe easily while on display. We arrange them in a user-friendly way that allows enthusiastic little participants ample room to feel their way around our very tactile exhibits. Children wash their hands without soap to ensure no chemicals or sunscreen residue is passed onto our animals. We normally present multiple sessions at any one location, quickly re-setting between shows to make it fresh for the new group. Pack up time takes another half hour as water is changed again to prepare the animals to move to a new location where we repeat the whole process. When the final program is over and everything secured in the van, we head home to return our animal ambassadors to their tanks and begin the feeding regime. We have half a dozen different food sources to distribute to our creatures, their diets carefully regulated to mimic conditions in the wild. On days when we don’t have displays to set up, we maintain our tanks, receiving 1,500 litres of ocean water every couple of weeks which we store and use when needed. Even though our animals may only be on display for short periods in the day, a lot goes into keeping them happy and healthy. But we know all the cleaning, all the prep work and all the sitting in traffic is worth it if it helps the next generation learn to love, appreciate and protect our waterways. This entry was posted in Uncategorized on April 12, 2019 by oceanlifeeducation.